2000 Monterey 242 Cruiser The 2000 Monterey 242 Cruiser is a great starter boat with plenty of power to make your time on the water enjoyable. The boat has a 5.7L Mercruiser engine with a Bravo Three drive and comes with a trailer. 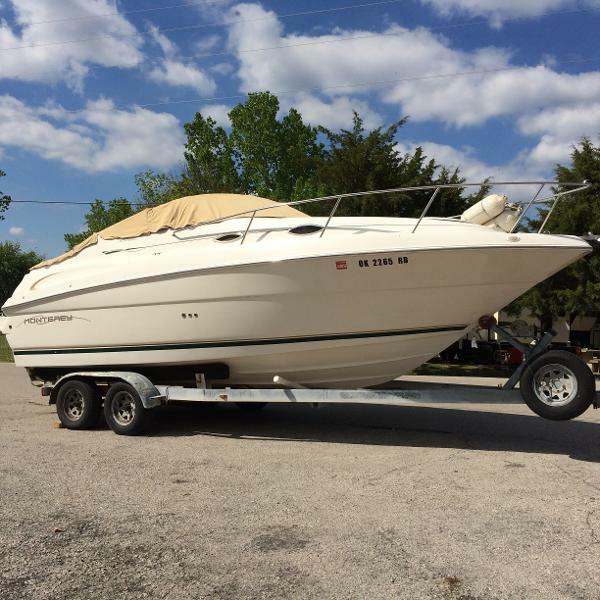 As per the seller, the boat is in very good condition inside & out for a vessel this age. Freshwater boat, the owner would like to keep it, but traveling for the next few years, and wishes for someone else to enjoy. Seller believes siphon on the toilet was patched, may need to be replaced, but all other items on the boat, work as they should. Stock #161656 Great Boat! Ready to Zip Around the Lake, Do a Quick Overnight! Fun Vessel! 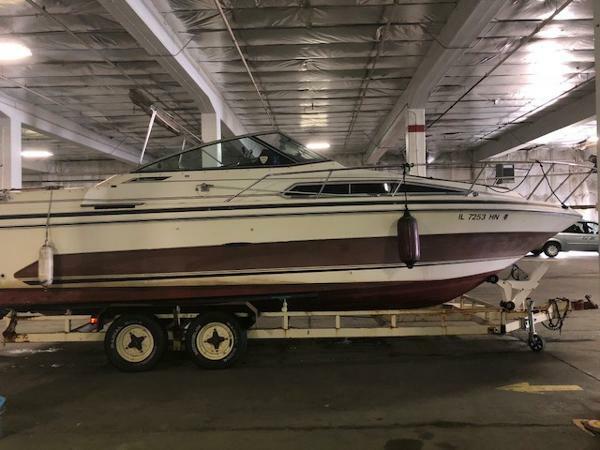 If you are in the market for an express cruiser, look no further than this 1998 Monterey 242 Cruiser, priced right at $25,650 (offers encouraged). 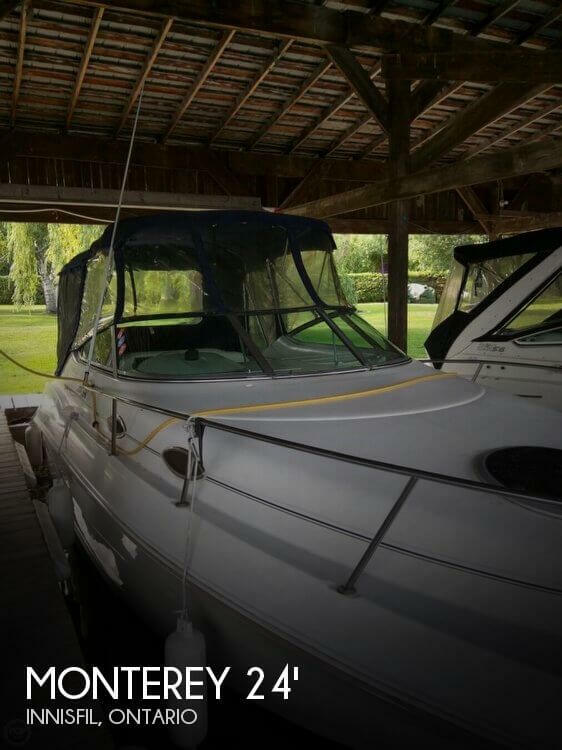 This boat is located in Innisfil, Ontario and is in great condition. She is also equipped with a Mercruiser engine that has 650 hours. Reason for selling is traveling and not going to be using it. The engine compartment is clean and tidy and appears to have been well taken care of. The hull also appears to be in good condition. The boat has been stored under cover. The interior is clean but does show some signs of moisture, probably from condensation. The upholstery is in good shape but is starting to show its age from years in the sun. The speed sending unit has been knocked off its bracket and may needs to be repaired or replaced. Stock #160756 Very nice 1999 monterey 242 cruiser! Ready to hit the water! 1999 Monterey 242 Cruiser WOW... This one is a Beauty!! Extremely Clean, Well Cared For and Maintained. Monterey 242 Cruiser on a Galvanized Tandem Trailer. Mercruiser 5.7L/Alpha Features include: Epoxy bottom with VC-17, Cockpit cover, Camper with both clear and solid sides, Cockpit carpet, NEW boots and bellows on drive. DON'T LET THIS ONE GET AWAY!! Only $219.00 per month. With approved credit and 20% down. 4.99% APR/120 months. PICTURES COMING SOON. 2000 Monterey 242 Cruiser 2000 Monterey 242 Cruiser powered by a 300hp Volvo Penta with DP (dual prop) drive. New outdrive in '09, shore power cord, AC, cook top, fridge, head w/shower. Full cockpit cover. Comes with a tandem axle trailer. 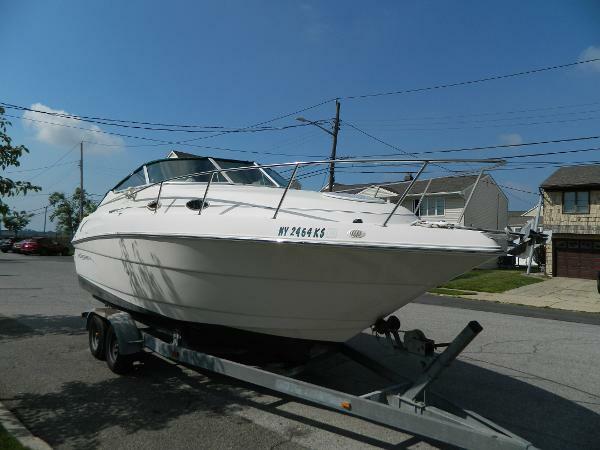 2002 Monterey 242 Cruiser Immaculate 1 owner Warehouse kept 24' Monterey Cruiser. Less then 400 hours freshwater used. Clean interior w/ fridge, microwave head and more. Engine serviced yearly, all new vinyl throughout cockpit as of 6/9, full detail and wax as of 6/5. Large swim platform for easy on and off use. 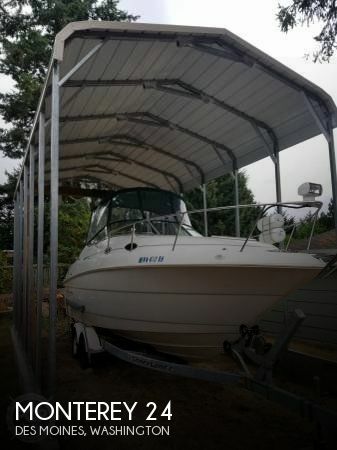 Has multiple different covers for storage or use with bimini and isinglass all good condition. Comes on great steel two axle trailer in great shape no rust! 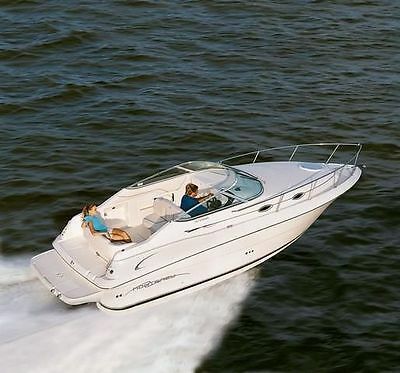 This boat is turn key ready and great for immediate consistant use. 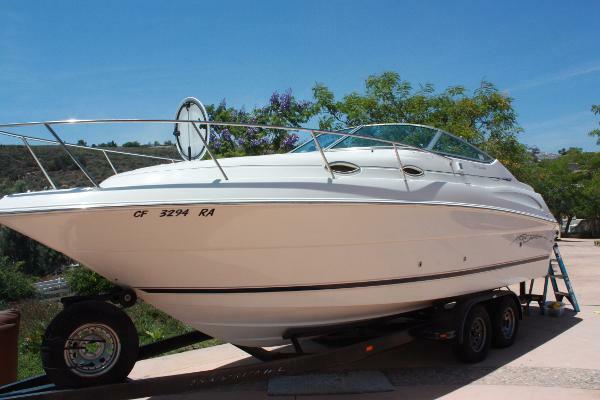 Excellent condition 1998 Monterey 242 Cruiser for sale. Low 180 hours on boat/engine. Features the highly regarded Volvo-Penta 5.7 GS engine with a Volvo-Penta SX Cobra Outdrive. Includes Bennett hydraulic trim tabs with helm indicator, dual batteries with switch, fresh water cooled engine, white hull and deck, full green canvas, cockpit cover, stand up head/ shower with on board 21 gallon waste tank, two sinks (galley and head) with 21 gallon fresh hot/cold water tank, pressure water system, stand up cabin, dinette seating with table inside cabin, sleeps 4 adults, deck seating for 6 adults with table, depth finder, a new Standard Horizon VHF radio, deck and cabin lighting, water heater, macerator with Y valve, dock power equipped, transom shower, Halon fire suppression system, ski/tube hook up, upgraded electric refrigerator/freezer and single burner electric/alcohol stove in galley, an upgraded 16 pound claw anchor, and a transom door for easy access to the swim platform which features a folding ladder. Includes a 2004 Nextrail tandem axle aluminum trailer with four wheel electric drum brakes and spare tire mount. Boat history:The current owner purchased this Monterey 242 Cruiser from the original owner in 2005. At the time of purchase in 2005 the boat had 122 hours. The boat has never been stored or moored for long periods in the water. It has been trailered after each use – that’s why it has never been bottom painted! This 242 Cruiser was only used in fresh water until 2014. In 2014 and 2015, it was taken up to explore the San Juan Islands and Canadian Gulf Islands for a total of 15 days use. Fresh water internal flushing was performed after both trips. The current owner is a retired commercial pilot and understands the importance of regular maintenance for both his airplane and boat. In addition to winterizing in the fall and making ready every spring, the oil has been changed every year and the plugs changed every other year. Additional engine and outdrive maintenance was performed as needed. In the past three years this 242 Cruiser has had new batteries, a new impeller and water pump, new “glass” for the canvas enclosure, a new Standard Horizon VHF radio, new cabin fans, and a new marine Kenwood AM/FM/CD/USB player. Specs: Hull Shape: Deep VeeLOA: 24 ft 2 in Beam: 8 ft 6 in Minimum Draft: 1 ft 7 in Maximum Draft: 2 ft 11 in Bridge Clearance: 7 ft 0 in Deadrise: 20 ° at Transom Dry Weight: 4500 lbs Cruising Speed: 22 Knots at 3200 RPM Max Speed: 32 Knots Engine: Engine Brand: Volvo Penta 5.7 GS Engine Model: 5.7 liter V8 Engine/Fuel Type: Gas/Petrol Drive Type: Stern drive Outdrive: Volvo Penta SX Cobra Engine Power: 250 HP Electrical: 110 V AC electrical system 12 V DC electrical system Battery charger (2) Batteries Dockside electrical cables Tanks: Fresh Water Tanks: 1 (21 Gallons) Fuel Tanks: 1 (70 Gallons) Holding Tanks: 1 (21 Gallons) Accommodations: Number of single berths: 4 (2+2) Number of heads: 1 Electronics: VHF radio Depthsounder Mechanical Equipment: Side console engine control Automatic halon fire control system Hydraulic wheel steering Bennett trim tabs Engine temperature alarm Bilge blower Hot water heater Fuel filters Engine fuel shut-off valve Automatic bilge pump Trim tab indicators Additional Features: Kenwood AM/FM/CD/USB stereo with four Pioneer speakers Carbon monoxide warning system in cabin Bimini top w/ full camper enclosure Mooring cover Bow pulpit w/ rails Navigation lights Cockpit transom shower Manufacturer Provided Description The Monterey 242 Cruiser packs more than one would ever imagine into its 24 feet, 2 inches. There’s a triple helm seat backed by an aft-facing triple seat. With the transom seat, there’s room for nine people. The walk-thru windshield with molded-in steps makes it easy to move about forward, and a walk-thru transom door does the same for moving aft. The integrated swim platform includes a recessed telescoping boarding ladder, wet storage, and ski rope compartment. The helm station features full instrumentation and tilt steering wheel. The removable ice chest, plentiful drink holders, and a standard top with side and aft canvas are all standard equipment on this stylish pocket cruiser. The 242 Cruiser has many of the comforts found only on larger craft. Forward, the dinette offers spacious seating and converts into a luxurious double berth. A mid cabin with double berth completes the sleeping accommodations for four. On the port side is a one-piece molded fiberglass galley built for easy cleaning. It’s complete with an icebox, alcohol stove, sink with faucet, 12-volt direct / indirect lighting, and generous storage compartments. And don’t forget about the optional Weekend Package which includes AC/DC refrigerator, alcohol electric stove, battery charger, cockpit carpet, hot water heater, heat exchanger, hot and cold transom shower, manual pump-out head, and shore power.